September 7, 2018, ©. Leeham News: In the last Corner we looked at the drag hump which is created by several supersonic effects when an SST (SuperSonic Transport) passes Mach 1. Now we will look at other aerodynamic problems facing an SST. Figure 1. The Aerion AS2 SST with its main systems. Source: Aerion Supersonic. We have seen passing the Sound Barrier is one of the challenges for an SST. The drag hump requires slender aerodynamics and strong engines. Once past the Sound Barrier, another problem appears. A subsonic aircraft has the center of lift for the wing at about one-third of the wing cord. Past Mach 1 the center of lift passes well aft of this point, the pressure distribution at supersonic flight is different. To keep level flight, one must trim the aircraft with more up-elevator. This causes increased trim drag. 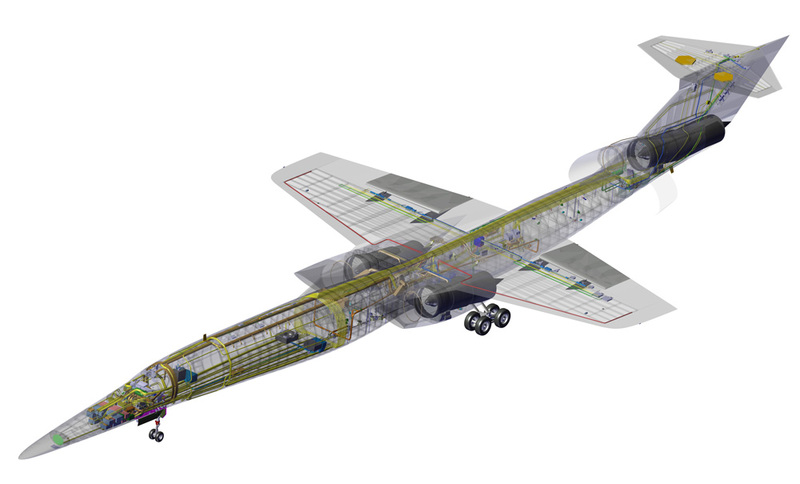 For a tailed design like the Aerion AS2 in Figure 1, the tail, which is placed at a distance to the wing, can create the nose up moment without excessive elevator angle and therefore drag. For a tailless Delta like the Concorde or Boom SST (Figure 3), the tail arm is short and the wing elevons need a higher angle to counter the nose down pitch moment. Trim drag is high. To counter this the Concorde had a center of gravity which could be moved back at supersonic flight, Figure 2, and then forward again for flight below Mach 1 and landing. Figure 2. 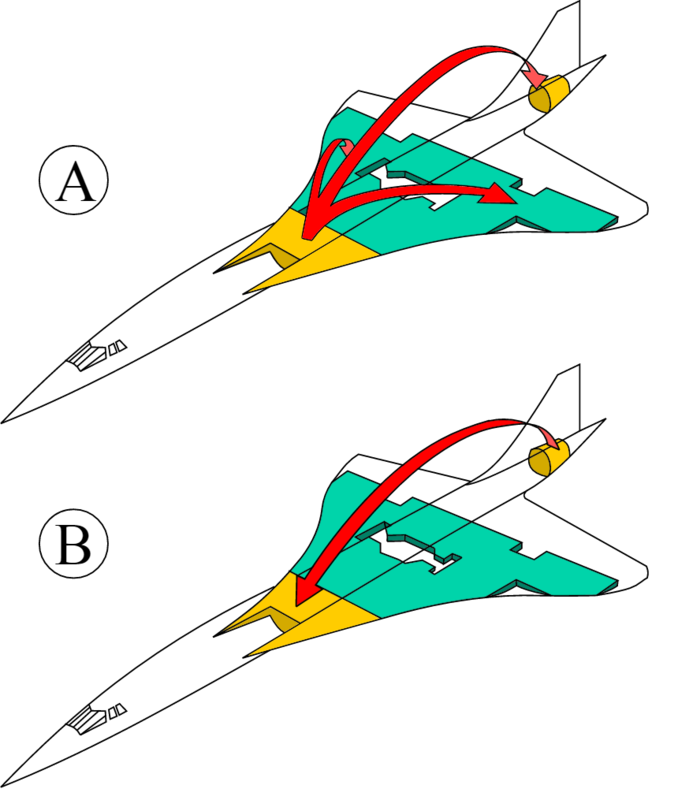 Concorde trim tanks to adjust the Center of Gravity for supersonic flight (A) and back again before landing (B). Source: Wikipedia. This reduced the elevon trim needed and therefore the trim drag. The Boom SST has an engine in the tail. It remains to be seen how it will counter trim drag. Figure 3. 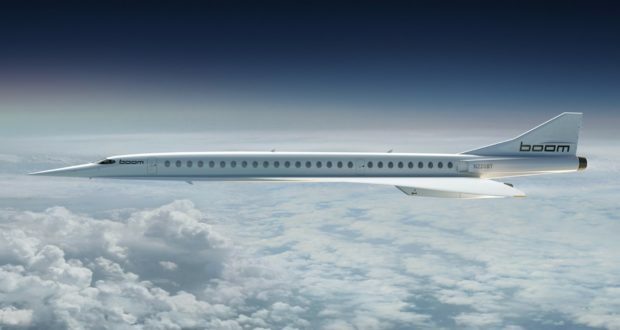 The Boom Supersonic SST. Source: Boom Supersonic. Another problem with SSTs is the landing. The wings need a higher angle of attack to generate the lift needed at the slow speeds of a landing. A tailed design like the AS2 can have powerful flaps which create lift. But these also lower the angle of attack when this lift is developed. A wing with deployed flaps generates a strong nose down pitch moment. Once again, the tail arm of the AS2 is handy to control the pitch of the aircraft during landing. A tailless delta has no flaps and the lift is generated at high angles of attack. I flew the SAAB Draken delta and it developed the landing lift at 11° angle of attack. The Concorde and Boom SST planforms are similar; so the angle of attack will be in this bracket, Figure 4. Figure 4. Concorde at touch down. Source: BBC. At 11 degrees nose up angle for the aircraft, the pilot can no longer see the runway once at landing speed. 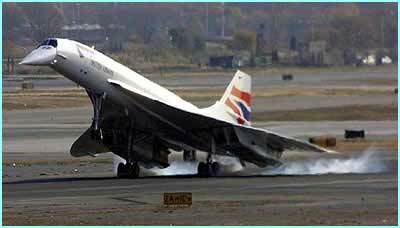 The Concorde and Tu-144 solved the problem with a droop nose. How the Boom SST solves the problem is not clear. There are more aerodynamic problem areas with an SST. A major one is the heating of the aircraft skin when flying at high supersonic speeds. This will be the subject for our next Corner. yes, the Vought F-8 Crusader. It simply tilted the wing leading edge up from the fuselage to give the fuselage a lower angle of attack and by it the pilot adequate view of the runway/ship deck. Yes, a forward-looking TV camera like the enhanced vision systems can be used, but what will FAA say? Will it be approved as the primary and only way to see the runway during approach and landing? I think enhanced vision systems will come to be accepted. In the UK from 2019 the ATC tower for LCY (London City Airport) will actually be located at a remote air traffic control facility some 80 miles away at Swanwick. 14 high definition cameras at the top of a 50 metre (164′) tower will provide a 360 degree view. Saab appear to be very active in this area with digital control towers already operational at a few small airports in Sweden, and at Linköping. Budapest has plans for a digital control tower in 2020 I believe, Changi (Singapore) is being planned. In the USA, there is the Colorado Remote Tower project. Australia, and Ireland are also conducting evaulations. Perhaps a future corner could look at emerging technology for these digital control towers ? Hence, I don’t see haven in electrical vision system as primary option – at least without “classical” (window) backup…. Interesting argument, but I don’t think that these days airliners have a sextant just in case the electrical navigation systems fail.Cars are not allowed cameras instead of wing mirrors yet either, but you could do some clever things with them to increase safety as well as decreasing drag. It must not be a coincidence that the Aerion AS2 has the same general shape and layout as the Lockheed F-104 Starfighter. I don’t think its a coincidence. F-104 implemented the concept of supersonic natural laminar flow enabled by low wing leading edge sweep, and thin airfoil profiles with sharp leading edges. At the time it was considered a way of reducing total super sonic drag and it was shown a low-sweep wing flying supersonic can easily maintain laminar flow (due to a strong favorable pressure gradient along its chord, right up to the shock). A clean F-104 wing at super sonic speeds could maintain more than 50% laminar flow. Aerion is building on that idea, they have published papers about their work and there is good empirical evidence that supersonic NLF worked well on the F-104. To my knowledge the Starfighter is the only airplane that implemented it. The leading edge of the Starfighter wings was so sharp that on the ground they put a protective cover over it. Thanks sgolshany for the interesting info. The center of lift moves on a “normal wing” from approx 1/4 chord to 1/2 chord when going supersonic if I remember right. But for delta wings the movement of center of lift is much less and is located approx at 1/3 chord. A strake or a blended in strake like on the Concorde reduces transonic drag by up to 10% and also helps reduce movement of center of lift. (Ref Lamar NASA) Still new fighter aircrafts are designed without the delta wing strake for unknown reasons. Even the old F-16 and F-18 has them. I don’t think there are going to revive the supersonic jet flights. They are earning good profit from using standard commercial planes and every day they try to move to more efficient planes. What killed the Concorde was the high maintenance and problems with mechanics. With the current tech and advancements, I don’t think there would be too many mechanical issues but the high maintenance costs would be a problem. Not many people would like to pay pricey flight tickets. The vast majority of customers prefer the economy fare.